Add some colour and sparkle to your look with this addition to the Equilibrium Girls jewellery range. This colourful and vibrant charm bracelet showcases a shimmering silver link chain surrounded by a pink coloured array of charms including an owl, a flower, a butterfly and a teddy bear. The charm bracelet is touchingly finished off with a hanging Equilibrium silver token and an easy access metal clasp to fit the bracelet with. 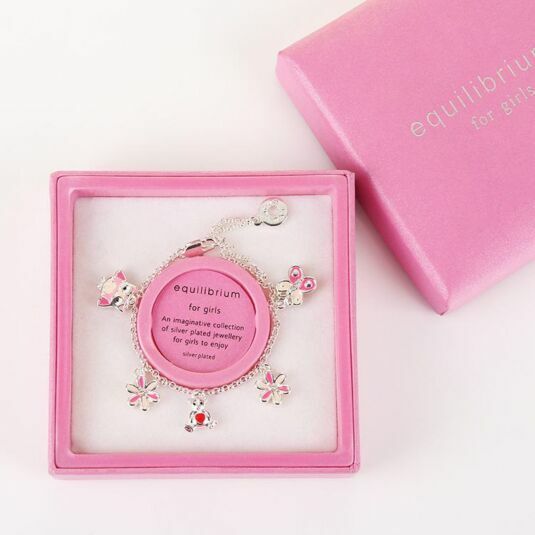 Beautifully packaged in a subtle pink Equilibrium branded gift box, this charm bracelet would make the perfect present for any young girl looking to add that finishing touch to their outfit.